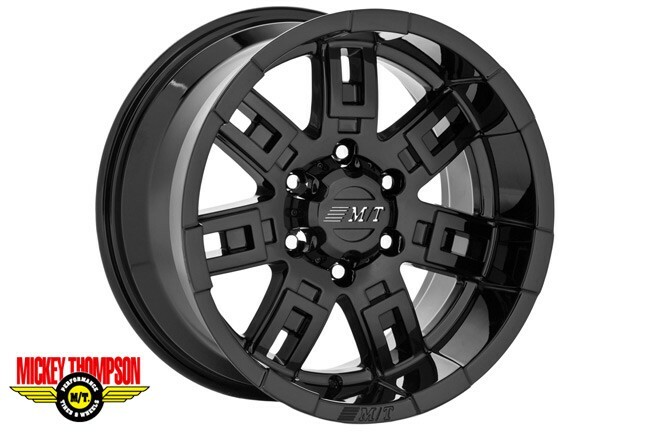 Styled after one of the best known innovations in off-road history, Mickey Thompson's revolutionary "tread-on-the-sidewall" tire design called SideBiters®, this new wheel is built to be a heavy duty performer with an easy to clean high gloss finish and exceptional styling designed to make your Jeep, Truck, or 4x4 look great! Tough high gloss black finish. High strength low pressure casting. Embossed center cap with M/T logo.